Ariens Deluxe 30 EFI is the world's first Electronic Fuel Injected engine which means there is no carburetor and is easy to start even with old fuel left over from last season. Keep tough weather conditions under control with the Ariens Sno-Tek 2-Stage 28-inch Gas Snow Blower. 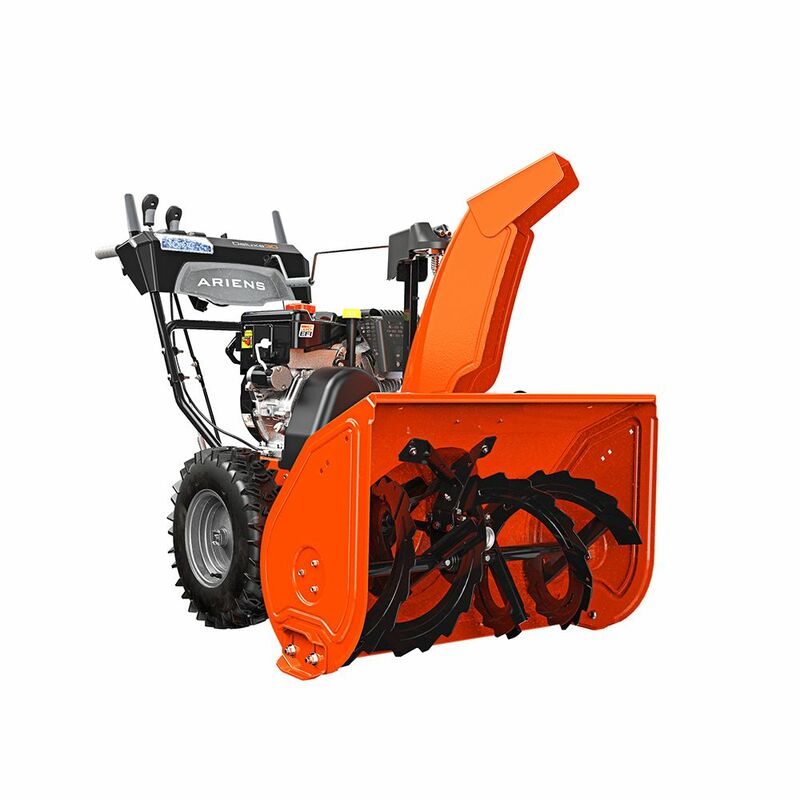 It features a 28-inch clearing width, a 20-inch intake height, all-steel augers, and a 3-blade impeller for powerful and efficient snow removal. Six forward and two reverse speeds let you change the speed to match the conditions, and the 205 , quick-turn chute lets you direct the snow where you want it. A simple, push-button electric start allows for ease of use, and the rust-resistant exterior on the snow blower helps ensure a lasting life. Extension cord not included. Deluxe 30 EFI 2-stage 306cc EFI Engine 30 inch Clearing Width Electric Start Gas Snowblower Ariens Deluxe 30 EFI is the world's first Electronic Fuel Injected engine which means there is no carburetor and is easy to start even with old fuel left over from last season. Deluxe 30 EFI 2-stage 306cc EFI Engine 30 inch Clearing Width Electric Start Gas Snowblower is rated 4.5 out of 5 by 82. Rated 5 out of 5 by remodelfreak from This snowblower throws the snow a great distance. You won't have piles of snow so close to the w... This snowblower throws the snow a great distance. You won't have piles of snow so close to the walk or driveway. Starts easily and love the hand-warming handles. Rated 5 out of 5 by Jeremy from I did the a lot of research into trying to... I did the a lot of research into trying to find a snowblower for myself, and everything about this one has lived up to the hype thus far! I was skeptical about it throwing snow up to fifty feet away, but I can attest that it can probably send the snow further than that! It is very simple to use and can chew up older snow packed piles of snow with ease. The machine starts up with the pull cord on the first pull every time. The only negative thing i can say is that in really deep/heavy snow the machine does need a little patience to catch up with its snow throwing abilities as the chute is only so big, just let go of the drive handle and let the snow fly for a few seconds before continuing on with your task. Rated 5 out of 5 by MattM from Fires up on the first pull. Moves snow like a... Fires up on the first pull. Moves snow like a boss. No problem getting through the mountain the city plows push to the end of the driveway. Complaints are the chute moves a bit w/the vibration of the machine and the front is light so it doesn’t scrape the driveway as clean as it could.Good buy. Rated 5 out of 5 by KeriD from Easy to use right from the start!... Easy to use right from the start! Rated 5 out of 5 by woody from used twice and works great. i have worn out asphalt... used twice and works great. i have worn out asphalt with rock sticking up and did'nt have any more problem steering than with my old powersmart. Never had to stop and wait for auger to catch up once in about 6 in. heavy snow. Love the efi.